TORONTO, April 20, 2018 – Economic confidence among Canadian accountants is at a record level, according to a global survey released today by the Association of Chartered Certified Accountants, a global accounting body. The Global Economic Conditions Survey was carried out jointly by the ACCA and the Institute of Management Accountants (IMA) and is the largest regular economic survey of accountants around the world, in terms of both the number of respondents and the range of economic variables it monitors. 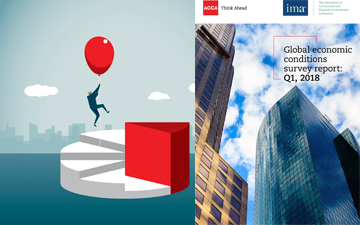 Fieldwork for the Q1 2018 GECS took place between 27 February and 15 March 2018 and attracted 1,418 responses from ACCA and IMA members around the world, including more than 100 CFOs. North America was the most confident part of the world economy in the first quarter, followed by Africa. Confidence in OECD countries rallied in the first quarter and is now at its highest level in a year. The improvement in confidence is consistent with the actual GDP data, which shows the U.S. economy continuing to perform strongly, with unemployment at multi-year lows and wages recovering nicely. The ACCA/IMA report is on the heels of a similar, business optimism report by the Chartered Professional Accountants of Canada (CPA Canada), which reported a shift from an optimistic to neutral stance by Canadian accountants. The CPA Canada report is based on a more recent survey of Canadian accountants, from March 13-29, 2018. The CPA Canada survey is based on 408 responses — presumably larger than the ACCA/IMA report — and is focused solely on Canadian accountants in leadership positions. As reported by Canadian Accountant, both surveys come at a time of robust economic figures, with the unemployment rate at its lowest number since 1976, which may account for business challenges such as employee retention and a lack of skilled workers. Uncertainty over NAFTA negotiations continues as well.